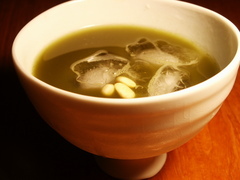 In Japan, a few companies have introduced green tea liqueurs. Unfortunately, the ones I've tried tend to be outrageously sweet and tend to taste best blended in very small amounts with a lot of shochu. I loved the idea, though, so I tried to create a more drinkable infused gin rather than a syrupy gin-based liqueur. My version, much less sweet, turns out to work well as a base for a green tea martini. In a cocktail shaker with a few ice cubes, pour 3 fl.oz. matcha gin and your preferred level of vermouth. I generally just wash the glass with vermouth. Shake, then pour into a martini glass. Garnish with three pine nuts. I also like serving the matcha martini on the rocks in a Mashiko celadon-glazed wine goblet, as pictured. If you want a fresher, more brilliantly emerald green drink but a slightly less complex flavor, whisk a heaping teaspoon of Matcha Latte Mix with a bit of water and 3 fl. oz of gin, then shake with your ice and vermouth. 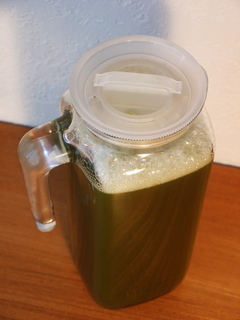 Whisk Three Tree Tea "Ippuku" brand Matcha Latte Mix with water to dissolve, then mix in gin. Pour into a sterilized, neutral spirits washed, airtight glass container. Shake vigorously. Store preferably in a cool, dark place. Shake daily for about 5 days, then store in your freezer. Drink as a digestiv or blend into your own cocktail creations. See our Matcha Martini recipe, above, or try blending with a bit of milk. If you prefer vodka over gin, you can make a "matcha infused vodka." I bet you'd have good results with some Japanese shochu or Korean soju also.